All I can say is the photo does not do this pie justice at all! The flavors in this pie are totally awesome! I was in a hurry and this should have been chilled longer so make sure before you cut it, it's cold! I happen to like my puddings warm when I eat them but that's not the way this one should be served. I really love the rum in this pie, of course you can substitute vanilla or your favorite liqueur of choice! The top will bake and look like pecan pie. Browned and more a yellow thick layer. Perfect for the Holiday time as it does require a little more time than most and is special! If your in a hurry this will not be the pie of choice to make. Prepare the day before that would get the best results! Heat oven to 400 degrees. Place the pie shell in the oven and prick with a fork the bottom of the dough or use pie weights. Cook the pie shell for 11 minutes or until slightly brown. Melt the chocolate then cool. Add the condensed milk, egg yolks, rum and whisking all together until smooth the add pecans Bake on 350 degree for around 20 minutes. Cool at least 1 hour or more. Combine the brown sugar, cream and butter in a small saucepan. Boil until sugar dissolves over a medium heat. Remove from heat. In a small bowl add the yolks then whisk a small amount of hot mixture into the 2 yolks in that bowl, then return to the pan mixture. Cook and stir until thick around 3 minutes or so. Remove from heat stir in the coconut. Add the rum. Cool for around 15 minutes. Pour over the pie. Sprinkle with pecans Chill over night or at least 4 hours. 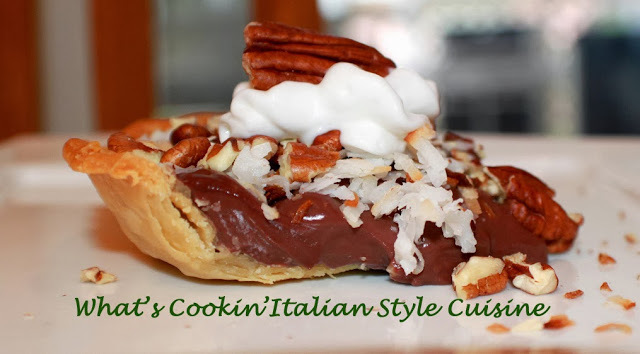 Serve with whipped cream and top with drunken pecans!